Museums can contact us to help them expedite research leading to the creation of display content which is original and beautiful. Our activity in exhibit development extends back to the early 2000’s. Since that time, AMSC Research has participated in numerous museum installations, creating one-of-a-kind content born from a deep commitment to discovery. Our brand of digital museology (Creative Visualization) is strongly grounded in image analysis. Using specialized software, we are able to enrich content and reach audiences. AMSC Research has proven expertise in the development of original imagery based on several types of rendering software. Examples of our versatility are wide-ranging and stem from experience in the field of mummy imaging going back to 2001. After working with 3D-printed models for many years, we created a life-sized torso of an Egyptian mummy developed from CT scan data in collaboration with the Bioanthropology and Digital Analysis Laboratory of the University of Manitoba, Winnipeg in 2009. This original research sculpture was later exhibited at the 3D Printshow, London (October 19th to 21st 2012) and in several other exhibitions. It became the first full-sized digitally-generated sculptural rendering of an Egyptian mummy ever produced in polyurethane. We are a leader in archaeological image analysis and editing. Our portfolio of projects includes dimensional graphics and volumetric animations such as fly-throughs and orbital hovers that are colorful and exciting. On 25 October, AMSC Research opened its 5000+ sq. ft. exhibition on Egyptian mummies at The Manitoba Museum in downtown Winnipeg. It featured the mummy of the Akhmimic woman named Pesed, on loan from Westminster College, New Wilmington, Pennsylvania. This was the third venue for the "Wrapped" exhibition, and AMSC Research was honored to be able to have its research materials on view by large audiences in an important Canadian cultural centre. AMSC Research was asked to assist in the analysis of a mummy located in an historic collection in Meran, Italy. Drs. Sabina Malgora, Chantal Milani, and Albert Zink were co-participants in the research. The preliminary results of the study of this elderly female were presented at the 8th World Congress of Mummy Studies, Rio de Janeiro, in August 2013. 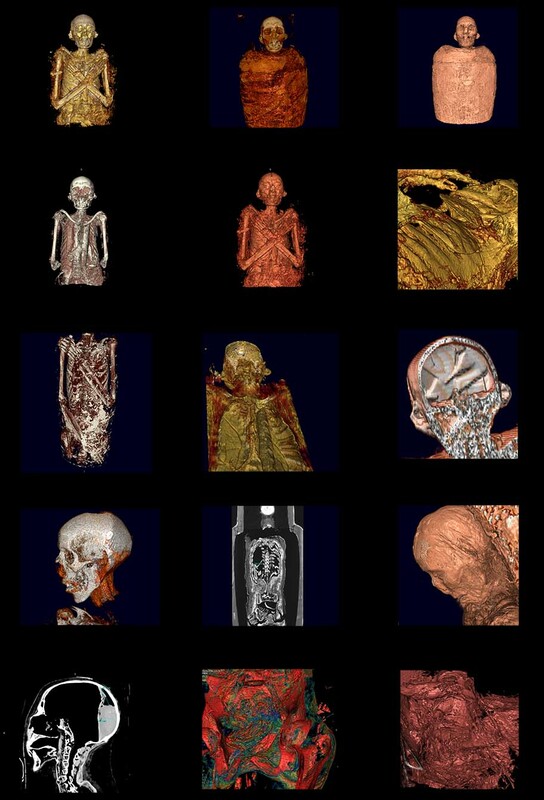 AMSC Research was asked to perform the analysis and forensic facial reconstruction of Padihershef following the successful CT scan of 4 March 2013. Padihershef (van Lennep's Mummy) was the first mummy to be imported to the United States (1823). He was only partly unwrapped by physician John Warren in that year and so survived to be scanned and studied today. AMSC Research was privileged to participate in this important project. 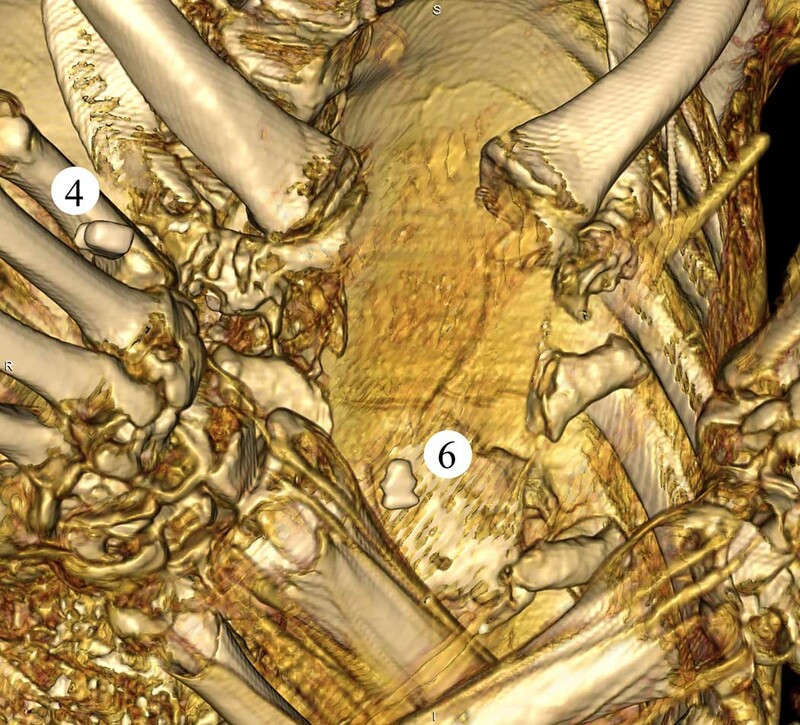 Peter Schertz, Curator of Ancient Art at the Virginia Museum of Fine Arts, Richmond, VA, invited AMSC Research to help analyze CT scan data of the 4000+ year old mummy of Tjeby (Tcheby), unearthed at the Upper Egyptian site of Sheikh Farag in 1923. The scan was performed for the VMFA by Dr. Jim Snyder at HCA's Independence Park Imaging Center on February 2, 2013. Tjeby was a nobleman who lived during a fractious time in Egyptian history known as the First Intermediate Period (2181 - 2040 BC). Central governmental authority had completely broken down, and power rested with community leaders in various provinces. Little is known about the methods and rituals of mummification common in the region at this time. Working on an individual mummified at such a remote period was extremely exciting. Museums are confronted by staleness in content which can quickly erode audience enthusiasm. This doesn't have to happen. It is possible to make collection material visually remarkable through research-based digital designing. The process is dynamic; it has been called digital museology. In our view, the objective of digital museology is to look at the static object or artifact in a display to move beyond it by exploring its informational potential. We learn new things about museum subject matter and extract analytical details from objects which contribute to telling more interesting stories. For more information, email us at: director@amscresearch.com.